In a small run-down rural town, man-made objects such as old cars slowly rust and never quite fit in with their backdrop; a vast natural terrain. Not unlike the abandoned cars (popularly and commonly personified as female gendered and/or as “babies”) a young boy and his many, even younger, siblings and cousins, try to get by in a familial landscape structured through the matriarch. Entirely devoid of strong or reliable male figure; fathers, uncles, grandfathers, all absent, even the male teachers within the community remain at a remove from offering guidance or advice (unless inside of paid school hours that is); all positions of morality and authority are held by female characters, offering a view of this small town community as ordered by the maternal insofar as it is motivated by a nurturing, survivalist ethos. Simple, sweet and subtly expressing concern for a lack of strong male role models in an underprivileged community, Boy (2010) is an endearingly comic “coming of age” drama. The film’s title character, known plainly as ‘Boy’, professes from the outset that in addition to having quite the extended family he is also a huge Michael Jackson fan. His adoption of an androgynous pop icon as ‘male role model’ goes some way to explaining the flawed absent father he so desperately longs for. 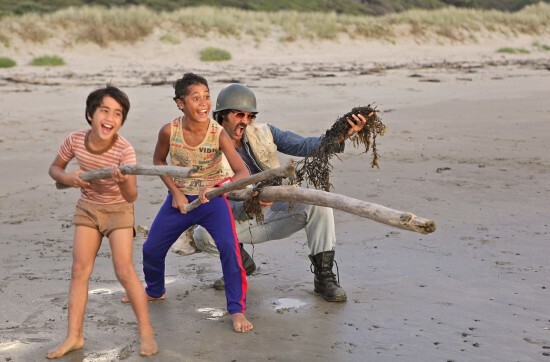 At an uncertain age where learning about life and girls are equally weighted, Boy is ecstatic when his father turns up unannounced with his so-called “gang”, The Crazy Horses. Learning a variety of all important lessons from his father; how (not) to treat a lady, how to steal and, most importantly, “don’t get into the Nazi stuff”; over his summer holidays, it is clear that his foray into a patriarchal structure is nothing more than a flirtatious summer fling. Too eager to take on the advice of others, Boy’s impressionability often gets him into trouble. But when the best “advice” he receives is, “It’s better to risk your money on something big, be really poor. It’s better than being a bit poor.”, it isn’t difficult to understand when, why and how things take a turn for the worse. The crux of the film comes when Boy realises (in a wonderfully Freudian moment) that the reality of satiating his desire (for a “father figure” in this instance) was ultimately traumatic and disappointing. In fact, when so-called “memories” of his father turn out to be fabrications of his own imagination, the return of the head of the matriarch (his grandmother) at the very end of the film marks the restoration of order, nurture and survival to the lives of Boy and his extended family. That the film and its title character are already gendered by their very naming indicates the wider prevalence of gender roles at play in the film. Thematically engaging, and certainly an endearing tale when taken at face value, Boy offers a gentle view from its warm filmic heart. Boy is released in Australian cinemas on Thursday August 26.